What’s old is somehow new again on the political left. Desperate for what they perceive as street cred, leftists continue to repackage failed policies as somehow novel, in a destructive race to claim the most extreme realms of the political continuum. Merely three decades after it was consigned to the dustbin of failed ideas, socialism actually maintains renewed popularity on the left. According to Gallup, a majority of Democrats no longer view capitalism favorably, but almost 60% view socialism positively. To avoid angering such a powerful voting bloc as seniors a month before a presidential election, the Obama administration threw together a multi-billion dollar smokescreen to defer the true impact of ObamaCare to Medicare Advantage participants until after the 2012 elections. The statement was designed to convince people that passage of ObamaCare would not disrupt their health care choices. Three years and a scheduled $8.35 billion later, 12 million seniors on Medicare Advantage are going to find out just how deceptive the President was… just not until after the 2012 elections. On Monday, the Government Accountability Office (GAO) released its findings from a performance review of a “demonstration project” by the Department of Health and Human Services (HHS). According to HHS, its Medicare Advantage Quality Bonus Program will run from October 2012 through 2014. Its stated purpose is to test an alternative method for calculating and awarding bonuses to private insurers who meet certain criteria under the Medicare Advantage program. Its real purpose is scurrilous and shameful. 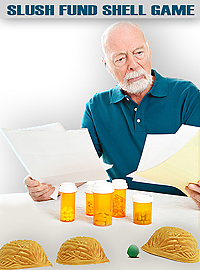 Medicare Advantage currently covers about one quarter of all Medicare beneficiaries, or 12 million people nationwide. The program allows private insurance companies to contract with the federal government to compete for Medicare beneficiaries. Bonuses are given to companies that meet certain benchmarks in quality and affordability. But HHS’s demonstration project isn’t testing an alternative to the current Medicare Advantage bonus structure. It’s testing an alternative to the bonus structure implemented by ObamaCare, starting this year during the annual October enrollment period for Medicare beneficiaries. Why would HHS test an alternative to a new program as it is being implemented? Because ObamaCare “bonuses” to Medicare Advantage are really cuts. In order to help pay for some of ObamaCare’s overall $2.6 trillion price tag, Medicare Advantage is scheduled to be cut by $145 billion over the next nine years. That means bonuses and regular compensation to Medicare Advantage providers will be slashed, making the plans considerably less affordable and driving many seniors into the traditional, government-directed Medicare scheme. HHS announced its demonstration project will cost $8.35 billion from 2012 to 2014; more than all other HHS demonstration projects combined since 1996, and more than ten times larger than the previous record-setter. Bonus payments under the demonstration project are based on past performance and include all three ranked groups of Medicare Advantage plans – an unprecedented expansion of the bonus system to reward 87 percent of all Medicare Advantage providers. As the GAO report points out, HHS’s Medicare Advantage demonstration program suffers from severe design flaws. By including all ranked Medicare Advantage providers in the test, HHS fails to satisfy the need for an uncompensated control group. It’s impossible to test an alternative when everybody is treated the same. No wonder GAO recommended that HHS cancel the deceptive demonstration project. The multi-billion dollar cost is a naked political expenditure masquerading as research.